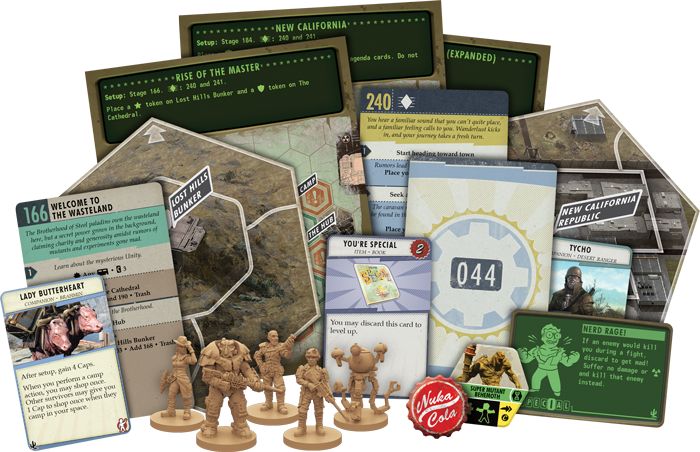 Fantasy Flight Games is happy to announce New California, a new expansion for Fallout: The Board Game! Order your own copy of New California at your local retailer or online through our website today! 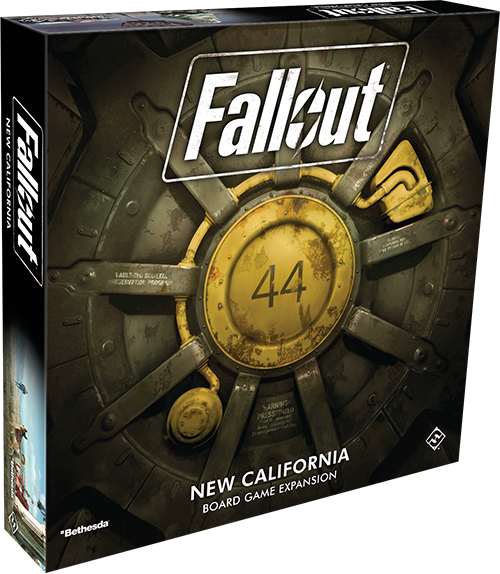 The New California expansion brings all-new challenges to the irradiated landscape inspired by Bethesda’s blockbuster video game series, inviting you cover even more ground when you return to the four scenarios you experienced in Fallout: The Board Game or enter sunny New California in two brand-new scenarios. While you're on these adventures, you can visit some of the most memorable locations from throughout the Fallout series, plumbing the depths of The Hole, breaking into the Lost Hills Bunker, or venturing into the imposing Cathedral. Each of the twelve new map tiles contained in this expansion brings with it the chance to meet new companions, unlock new vaults, and discover even better loot to conquer the wasteland. 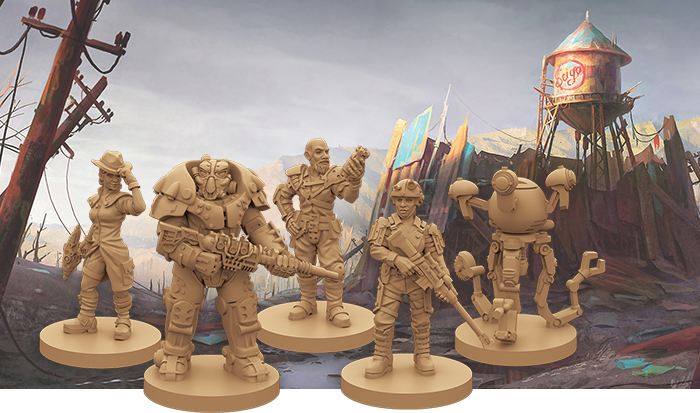 To seize these new opportunities and rise to the challenges of this balmy new locale, New California brings five new survivors to Fallout—each of them ready to comb the irradiated landscape for loot. Determined to live on their own terms, the Enclave Deserter has cut ties with their past life. Luckily, they’ve only decided to ditch the Enclave itself and not their advanced power armor. Not only does this gear provide protection from whatever mutated beasts they may encounter, it also gives them extra XP when they kill an enemy. The NCR Ranger, meanwhile, knows the desert better than anyone. So much better, in fact, that she can pick a more advantageous starting position at the beginning of the game and move across the rough hills of New California faster than the other survivors. Tired of performing chores for a master who's unlikely to ever return, Mister Handy has decided to set off on his own. Fortunately for him, one man’s junk is Mister Handy’s treasure and there’s plenty of junk to be found across the wasteland. Mister Handy can use Junk cards to repair himself and upgrade his defenses and, thanks to his many limbs, he has plenty of space in his inventory to carry a lot of junk. With her Trusty Sidearm in reach, the mysterious Lone Gunslinger has little use for company. Her weapon packs a punch, but also ensures that she’ll wander the wastes alone. The Caravan Merchant, on the other hand, will have no shortage of friends with all the caps they’ll have. They begin the game with extra caps and have plenty of opportunities to earn more. With their faithful brahmin carrying their wares, other players can pay the merchant to shop while camping in their space. Humankind has risen from the ashes of the old world into a weird world full of danger and—if you’re brave or foolish enough—opportunity. The New California expansion provides plenty of opportunity to make a name for yourself across its two new scenarios. The first opens as a secret power grows in the background threatening the grip the Brotherhood of Steel paladins have on the wasteland here. Could this new presence be related to the rumors of mutants and experiments gone mad? Before pledging allegiance to either side, you need to know more about the Brotherhood and the mysterious Unity. 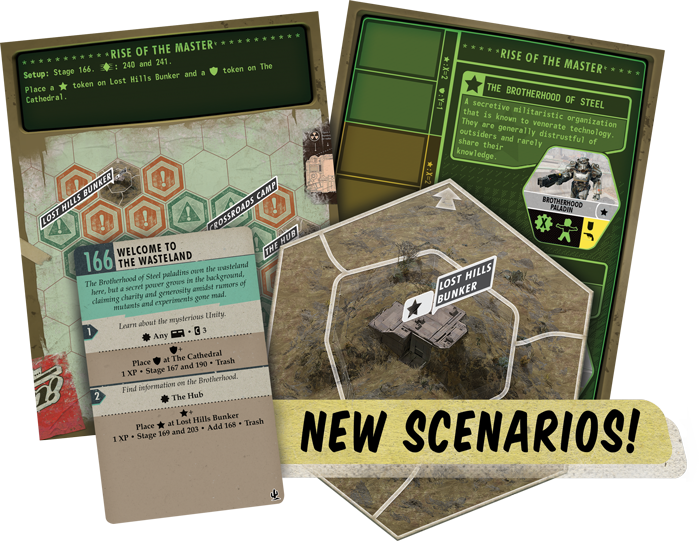 The second scenario, “New California,” introduces a new set of cooperative rules, allowing the survivors to work together for a common cause. The landscape of New California is unforgiving and the small village of Arroyo has been hit harder than most. Drought has brought the villagers to the edge of desperation, and in their hour of need they have turned to anyone who will listen. The village elder has heard of a device that might combat the drought, but where can one be found? You must search the far corners of New California if you’re going to help save Arroyo. 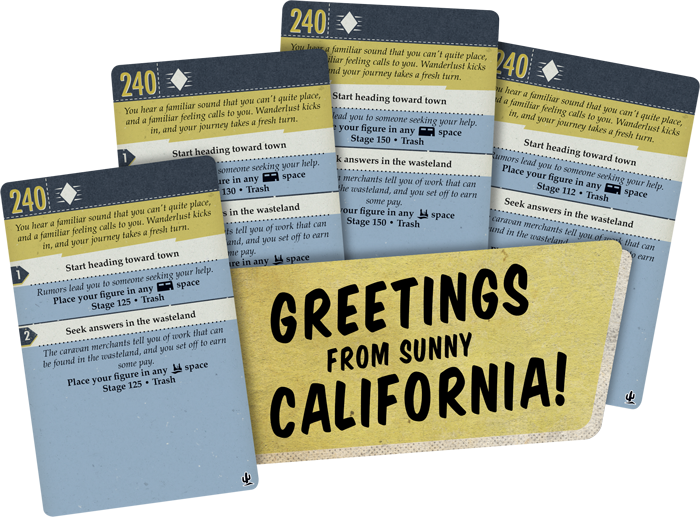 To add even more variety to your experience, New California introduces multiple unique copies of individual cards. While each card presents a similar narrative and choices, each one leads to different cards. Throughout the game, the choices you make with these cards can have wildly different consequences and open new opportunities. As only one copy of a card is added to the appropriate encounter deck, you can ensure that each of the new scenarios will play a bit differently each time. A new land of opportunity awaits you. It might also be filled with radiation and hideous monsters, but what's an accomplishment without a little challenge? It’s time to head into the wasteland. Welcome to New California! Look for New California (ZX03) at your local retailer in the fourth quarter of 2018! Pre-order your copy at your local retailer or through our website here!